When you follow your dreams you will have opportunities. 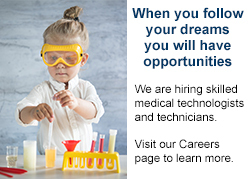 Consider a career in medical laboratory medicine. Laboratory Alliance is the area’s largest state-licensed laboratory, providing clinical and anatomic pathology testing to a 16-county region in Central New York. As the laboratory of choice for most local healthcare providers, more than 10 million tests are performed annually at our three laboratories in Syracuse, New York. Learn more about a specific test, locate a patient service center near you, reference our Directory of Services or consider our career opportunities, and let us know if we can answer your questions.